100% Legal for driving purposes per Louisiana law of Act 625 of the 2016 season. Louisiana State Police will accept the LA Wallet Digital Driver's License! ATC legally approved all responsible vendors to accept LA Wallet for age verification-required purchases. The LA Wallet App is made for Apple iOS and Android. Activate it for the cost of 1 premium coffee for the life of your current physical license registration. The iOS app went Live in the App Store Tuesday, June 26th, 2018! The Android version went live in the Google Play Store on July 2nd, 2018. LA Wallet is 100% Legal! Louisiana's Legislature paved the road for you to use La Wallet digital driver's license for driving purposes per Act 625, of 2016. Read More. Louisiana Digital Driver's License is always up-to-date. It "phones home" to the DMV to make sure your license is valid. If you forget your license at home but have your smartphone, Louisiana State Police will accept your LA Wallet driver’s license. Official acceptance at restaurants, bars, and TSA is pending approval. 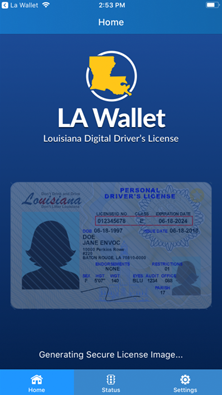 Your LA Wallet digital driver's license is only $5.99 for the life of your current driver's license! About the cost of a high-end coffee. Being one of the younger legislators, I realized just how crucial our digital devices are to each of us in our every day lives. 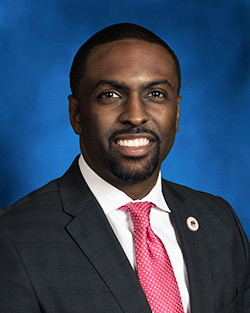 I authored the bill to digitize our Louisiana driver’s licenses in an effort to provide an easier option for our citizens while at the same time complying with our enacted laws to provide proper identification to our public safety officials. Once the bill was authored there were several legislators that joined as co-sponsors of the bill, after realizing the vast benefits it would produce. We also realized that if implemented correctly and expeditiously, we would be at the forefront in this digital arena. When the Louisiana Legislature passed HB 481 in 2016 (Act 625), we began the process for Louisiana to become the first state to allow for a digitized version of a state-issued driver’s license. We worked with the Office of Motor Vehicles, and it is an honor to see that we are ready to begin implementing the provisions of the bill in the spring of 2018. We are now focusing on how we can expand this to include a REAL ID-compliant driver’s license and a Louisiana Identification both to be digitized. While the electronic driver's license, available via app on smartphones, will not replace a photo ID in all capacities, it can be used for driving privileges and may be acceptable at airports, at the discretion of TSA. As we continue to move into a more digital age, this technology is not only more efficient but necessary. Since we are the first state to enact a bill of this kind, this is a big step, not only for Louisiana but for the country. You can read the law here.